One of the more interesting aspects of Banksy’s work is that it is so public and yet he maintains near complete and total anonymity. This is remarkable in a world where most people possess phones with built-in cameras that they carry around at all times and have easy access to outlets (e.g. internet, social media) where they can share images and information with the public. Oh, and the “news media,” they have professional paparazzi, phone hackers, investigators and cyber-sleuths whose sole job is to reveal, sensationalize and publicize this sort of story. Heck, Bloomberg even had the NYPD on him. Like a character in a comic book. Or to be more specific – a “particular living individual” real. And he always gets away and his identity remains a mystery. Whether you think he is a vandal or a genius he is one of the most famous artist in the world today. 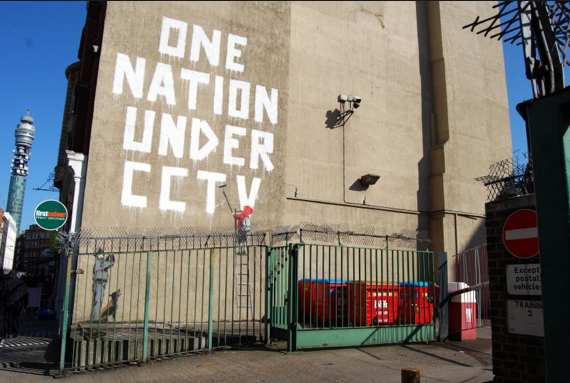 I understand that part of the point in wanting to remain unknown is to remove all hype and expectations and allow a work of art to stand on its own … apart from who ever the artist is (see Banksy’s 2010 film Exit Through the Gift Shop). We’ve seen J.K. Rowling secretly write and publish a novel under a pseudonym (Robert Galbraith) and have that work well-received by critics but the moment it was revealed that J.K. Rowling was in fact the author the book soared to the top of bestseller lists (ironically a lawyer spoiled it for her). We should not care who “Banksy” is because it’s not supposed to matter … but if an application is filed with the U.S. Patent & Trademark Office (USPTO) for a trademark that consists of a pseudonym – then technically it does matter. And an application to register BANKSY was filed. But guess what? … he got away with it again … and just like his art, it’s publicly available and right there for everyone to see. There is a pending and approved USPTO trademark application for BANKSY, App. Ser. No. 85198175, owned by the cheekily named “Pest Control Office Limited,” a U.K. limited liability company which acts as a “handling service … on behalf of the artist BANKSY” (read about the BANKSY U.K. registration here). For purposes of §2(c), a “name” does not have to be the full name of an individual. Section 2(c) applies not only to full names, but also first names, surnames, shortened names, pseudonyms, stage names, titles, or nicknames, if there is evidence that the name identifies a specific living individual who is publicly connected with the business in which the mark is used, or who is so well known that such a connection would be assumed. The reason for requiring consent is obvious — to protect rights of privacy and publicity that living individuals have in marks that identify them (there are numerous “dead” third party filings for BANKSY on the federal register for this very reason). If the mark comprises a … pseudonym … the examining attorney must determine whether there is evidence that the name identifies an individual who is generally known or is publicly connected with the business in which the mark is used … If there is such evidence, the examining attorney must inquire whether the name is that of a specific living individual and advise the applicant that, if so, the individual’s written consent to register the name must be submitted. And the USPTO still accepted it. But not “Banksy” … he was allowed to sign with his pseudonym. Notes to the File must not summarize arguments or legal conclusions. Rather, the Note to the File must merely list the issues discussed and indicate any agreement that may have been reached. If no agreement was reached, that should be noted also. 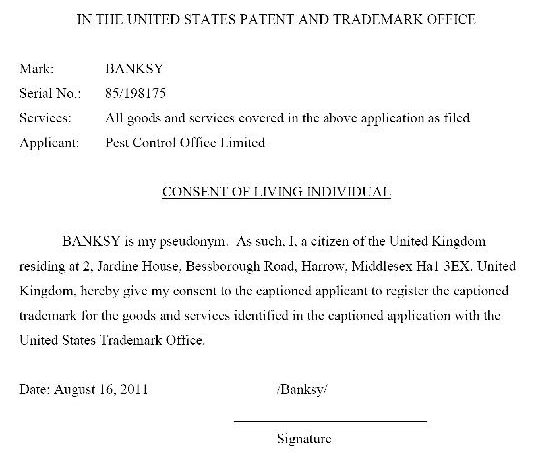 It appears the USPTO and Banksy reached an agreement that allowed Banksy to keep his actual name concealed. Just like a work of art you should have a look for yourself and draw your own conclusions.